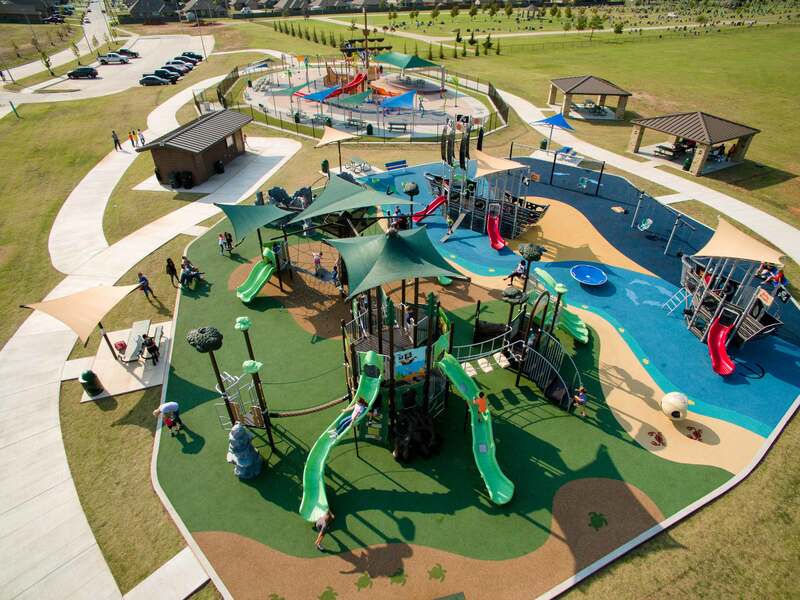 Little River Park was nearly unrecognizable following the 2013 EF5 tornado that tore through Moore, OK. Likewise, Plaza Towers Elementary school just blocks away, incurred tremendous damage, leaving children at a loss for the two places where they spent most of their time. However, in a multi-phase restoration project, with help from the CDBG Disaster Recovery Program, Moore kids finally have their favorite playgrounds back—and they’re better than ever. The city involved the school children in selecting the theme for this second playground at Little River Park, and even let them pick their favorite playground bid—ours! With the help of colorful, graphic unitary surfacing, this playground is an oasis of land meets sea. A Branch Out and treehouse-inspired play structure serve as the focal point for the land portion of the play area—a welcome return of “tree play” and shade following the damage of more than 3,600 trees in the park. Additionally, a RockBlocks structure mimics a “mountain climbing” play experience. Cross the narrow strip of “sand” and you’ll enter the sea portion of the play area. Two pirate ships (one with a sea serpent slide) inspire imaginary play, while several freestanding motion events offer spinning, shaking, and swaying activities. Now that both the north and south playground projects are complete, as well as a new splash pad playground, children in Moore can get back outside, put the past behind them, and just play.